Each year Retina Australia WA Inc holds a series of fundraising and community awareness events. By getting involved you not only help us to raise vital funds for research you assist us to facilitate support for individuals affected by an inherited retinal disease. We see a cure for blindness! Supporter Meet Ups happen on the last Tuesday of each month from February to November each year. We would be delighted to see you at our next one on Tuesday 31 May at 10:30am – Koko Black, 140 William Street, Perth. All members and supporters of Retina Australia WA are welcome. These meet ups provide a friendly and inclusive environment to mingle and network with individuals that face similar daily challenges, as they navigate life living with an IRD. Friends and family are also welcome. Meet Ups are facilitated by RAWA only, attendees are responsible for purchasing their own food and drinks. June’s Meet Up is scheduled for Tuesday 28 at 5:30pm at The Standard Perth, directly over the road from the Perth Train Station, 28 Roe Street , Northbridge. to stay up to date on What’s on at Retina Australia WA or join our Meet Up Group for further information on our monthly catch ups. Fundraising event for Retina Australia WA. More details on stall holder opportunities are available from our office on 9388 1488 or email info@rawa.com.au. Catch up on all the latest research and clinical trials happening across the country in one action packed day. Dionics, Gene Therapy, Stem Cells and More. Save the date – Saturday 15 October. Further details coming soon. 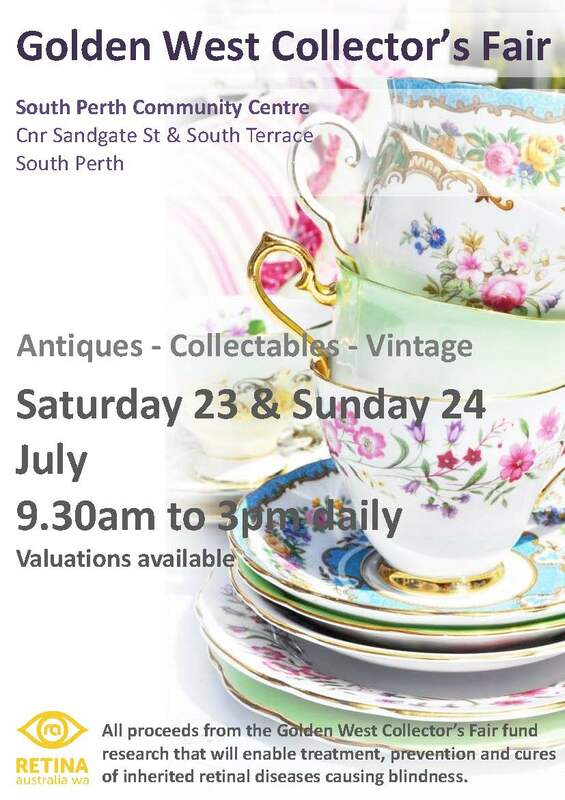 All new Valuation Trail allows you to bring along your treasures and have them valued at any time over the weekend. Specialist valuations of watches, clocks, coins, banknotes, stamps, oil lamps, metals, jewelry and gemstones. 2015 sees the return of the Retina Australia National Congress – Global Eyes. Make finding a cure for blindness your reason to run, jog or walk 21km, 12km or 4km around Perth’s stunning city. At this year’s HBF Run for a Reason we want you to join Retina Australia WA’s Platinum Charity Team The Visionaries as we chase a cure for Inherited Retinal Disease. For the thousands of Australian’s who are slowly losing their sight, it’s a race we need to win. Every step you take as part of Retina Australia WA’s Platinum Charity Team is a step closer to a cure. A spot in our Platinum Charity Team “The Visionaries”. Dedicated support, guidance and training advice. Inspiring pre-race team training session with Steve from Hot to Trott Performance Coaching follow by breakfast and a chat with Glen Loftus, Australian Olympic Silver Medal winner (Lightweight Mens Four at the Athens Olympics). All new Valuation Trail allows you to bring along your treasures and have them valued at any time over the weekend. Specialist valuations of coins, banknotes, stamps, oil lamps, metals, jewellery and gemstones. Making Tracks to Cure Blindness was a tremendous success in 2015, raising over $5,500 . We are already busy planning to make next year’s event bigger and better than ever. Thank you to the entire team at Castledare Miniature Railway for their continued support of our family fun day. A huge thank you to all our volunteers for their outstanding committment to the cause. And lastly, thank you to all that attended…. we had a fantastic day and we hope you did too.